Finger Picks are an interesting subject to look at. So many different styles of playing, so many different kinds of instruments and it is certain that the same pick does not suit everything. The construction material can be important to get a smooth sound but there are so many other considerations. Even the thickness and flexibility are all important to create the sound you want and with playing ease. The pick is a very important part of your equipment that is so often taken for granted. Some bass guitarists would never use a pick at all, likewise some folk guitar players. Some players just use a thumb pick; others only play with their fingers. What Are The Picks For? And The Best Finger Picks? The guitar picks that are produced by Dunlop are popular in all aspects of music. They take it seriously. They offer a wide variety of sizes and shapes and even construction materials, so there is always an option to get the right pick for you. Dunlop recognized that this piece of kit is at the center of your sound as a musician and therefore try to cater for every need. We are looking here at some of the finger picks they produce. This particular pick range is made from brass and comes in a variety of sizes and gauges to suit your needs from 0.13 inch to 0.25 inch. Metal-based picks will always deliver a sharper more defined sound than other materials and therefore are suitable for most instruments. In this case, guitar, banjo, and pedal steel would all benefit from brass picks. There is a thought that metal-based picks can cause damage to the strings and wear them out faster. We don’t see that as an issue and don’t feel there is any difference between metal picks and heavy duty plastic ones. Brass picks have some advantages in that they are more pliable than steel and can, therefore, be molded to finger size, though they are prone to lose their pliability quicker than a harder metal. Like most things Dunlop do, they produce quality, and these picks are certainly that. Produced on various gauges and sizes, you will find the perfect pick for what you use it for. Trusted by the pro’s, these picks are made for producing the best sound possible. They come in packs of 20. Well made in a variety of sizes and gauges. Brass will wear quicker than other metals. Most musicians who use picks will know the name National. They have been a forerunner in the production of instrument picks for many years, and they are the choice of many. In fact, these picks have been around since the 1930s and have stood the test of time. When using finger picks there is often a compromise between comfort, durability and the sound they produce. You can often find picks where the sound leaps out at you with great tones, but they are just so uncomfortable to use. These picks have been the banjo players choice for many years because they produce a great, crisp, clear sound but they are also comfortable to wear. They are available in packs of four, but the thumb pick must be bought as a separate item. It should also be noted that these picks only come in quarter inch size and are therefore not suitable for all instruments. They work well for banjo, but players of an acoustic guitar might need to consider them carefully. On a guitar, they are not a beginners pick. 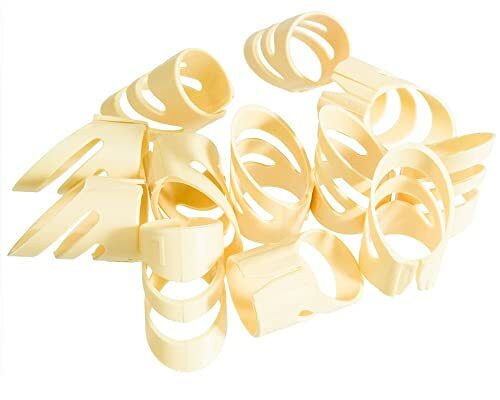 These picks are made from brass which makes them more pliable and easy to fit the shape of your finger. They are not as strong as the steel varieties but do produce a slightly softer sound. They will, however, not be as hard on your strings as some other metals will be. Brass is a good choice for your picks, producing a nice tone, but not being so hard on your instrument or your fingers. A quality pick, but not suitable for all instruments. Well made by a company with a reputation for quality. Not the cheapest you can buy. This pick has an interesting design. 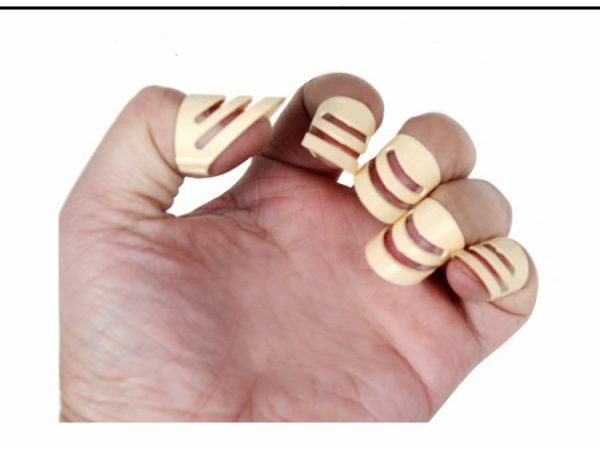 The manufacturer recognizes that some people like to play their instrument with their fingernails. 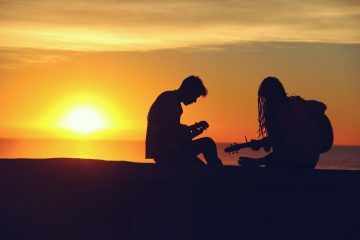 This we can fully understand in that it could be said that you get a greater feel for the string, and hence the music, if it is you, that is actually touching a part of your body, rather than a finger pick. Playing this way though has its own set of problems. Breaking a nail being the obvious one. If you break a nail what do you do carry on with three fingers and using fingernails and one finger using the finger? Can’t be done. This innovative design slips over your finger but then fits under your nail. You will still get the feel of the string, but the risk of breaking a nail is eliminated. You will have to keep your own nails a little longer to keep these in place, but some would consider that a small price to pay. They are made from acrylic and can even be filed down to suit your own finger. It is a novel and very clever idea if it works for you. We are not sure it will be to everyone’s liking, but if you play this style, it might be worth seeing if it suits. We have come across players that have grown their nails long, some who even glue on nail extensions, but in both of these cases, the results are fraught with danger for live concerts. We think you have a better chance with this product than hoping a nail won’t break or some nail glue will hold a false nail in place. If your technique demands have a look, it might solve a few problems. They come in packs of 12 and are not expensive. Will be a strange concept to some. Let’s move on to some fingerpicks with a more conventional design. 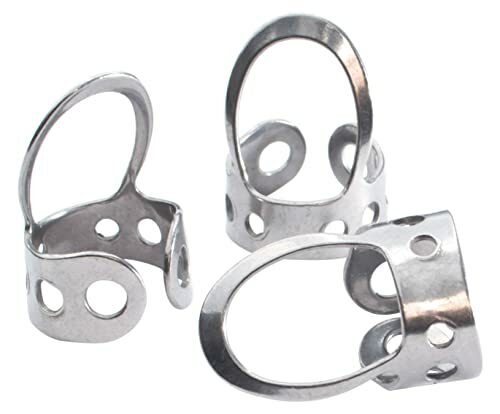 These are made from stainless steel which makes them lightweight and durable. They are especially suitable for guitar and banjo. They are designed to be ‘one-size fits all’. The collar of the pick can be adjusted to fit the size of your finger for comfort. They can be set to fit your fingers whether they are small, medium or large. The positive with these little picks is that you can make the fit precise. Some pics can move around, even turn around while you are using them because the fit isn’t quite tight enough. These picks negate that problem by being able to be adjusted to the exact size of your finger. This may take a little time to get used to and to be able to find the right sizes but the benefits are there to be seen. The added bonus is that because of the open design you will still feel the strings on your fingers somewhat. Playing with metal finger picks on the metal strings of a guitar might not be the optimum arrangement. The sound might be harsh and twangy. That might suit some styles but maybe not others. It’s possible these picks are better suited for banjo than guitar but you won’t really know until you try with your own instrument. They are well made but basic and cheap enough to experiment with. 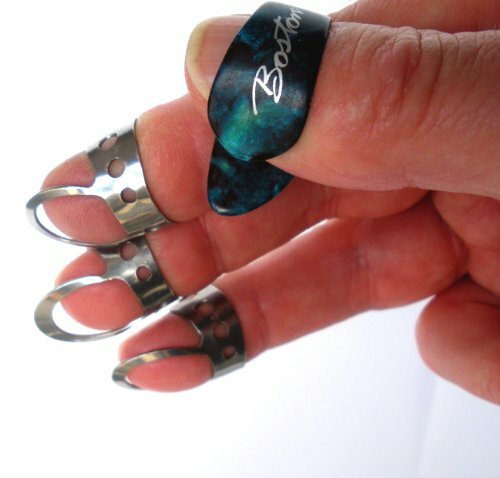 A good option for those seeking metal finger picks. The price includes three picks for fingers only. May take some time to adjust to using them. With this range, Dunlop has gone back to simplicity and basics, with finger and thumb picks that are made from plastic in an attractive shell design. The advantage of plastic picks is that they can be used on virtually any instrument without being invasive. Even the nylon strings of a classical guitar, often so difficult to get a pick to work with, sounds nice and warm. Whereas metal picks will really twang and sharpen the tone plastic will not. And, will provide a smoother more rounded sound which some will see as a big plus point. Of course, if a sharp twang is what you want or possibly need, then you will not get that very easily from plastic pics. These particular picks can come up quite small and if you have large finger,s then you might want to consider whether they will fit. Obviously, there are no formal size adjustments that are possible. You can try and stretch them a little but being plastic, they could snap. Are they comfortable and how good is the sound they produce? We are not going to dwell on the size. Everyone is different and what fits one person will not fit another. But the sound we can look at. These picks produce what might be best described as a neutral sound. They are not too sharp and twangy and have a nice ambiance across all the strings. They are therefore ideal for most types of music and many different instruments. Each pack contains a thumb pick and three finger picks at a very competitive price. A very neutral and balanced plucked sound. As with making all choices, it is a very personal thing, and what suits one will not suit another. The decision will depend on so many variables and not all of them are totally controllable. Nowhere is this more relevant than in music when buying equipment no matter how small or seemingly irrelevant to the ‘outsider’. Totally taken for granted by many, as just some bit of plastic you pick out of a box, and often chosen by which color or pattern they happen to like. Try telling that to a musician who relies on the sound the finger pick gives them or the ease of playing that it offers. Small it might be in size but small it is not in importance. So what will influence your choice? Or perhaps firstly which instrument. Some picks will perform better on certain instruments often determined by the sound they give. Metal picks are either loved or hated on acoustic guitars. Some find them too abrasive, others feel they offer a truer reflection of the sound. On a banjo, they are essential and also on steel guitar. Not so on classical guitar which needs a softer feel so plastic might give better results. Which instrument they are for and even the style of music is important to your choice. This choice may be dictated by their application as we have mentioned. Some instruments really should have a certain sound about them. Plastic is usually the cheaper option but then may not be easily adjustable for finger size. They will make a softer sound and some feel easier to use. Metal picks will last longer, often are able to be adjusted to fit your fingers and have a much more defined sound when the metal of the pick strikes the metal of the string. Comfort when wearing any finger pick is vitally important. If they don’t feel right, it probably isn’t going to sound right. They must not be too tight or they will pinch or worse, take the skin off, and they must not be so loose that they move around your finger or worse fall off. Even the material they are made from will influence how you feel wearing them. Some just cannot play with metal picks and just prefer the feel of plastic, others vice versa. This cannot be avoided. There are many things to consider, but the main ones are what instrument will you use them with, the need to feel comfortable wearing them, and, what sound do you want. We have reviewed some fine picks in our effort to find the best finger picks but it is your choice. What is best for you? Not an easy choice mainly because of the quality of what we have looked at. 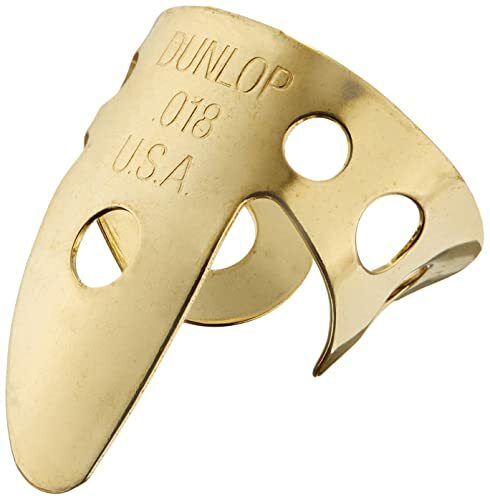 Manufacturers of finger picks with world-wide reputations offer an exceptional product and there are others who have been innovative in their thinking when designing their product. Simple, easy to use, adjustable, they offer us what we would need from a finger pick.